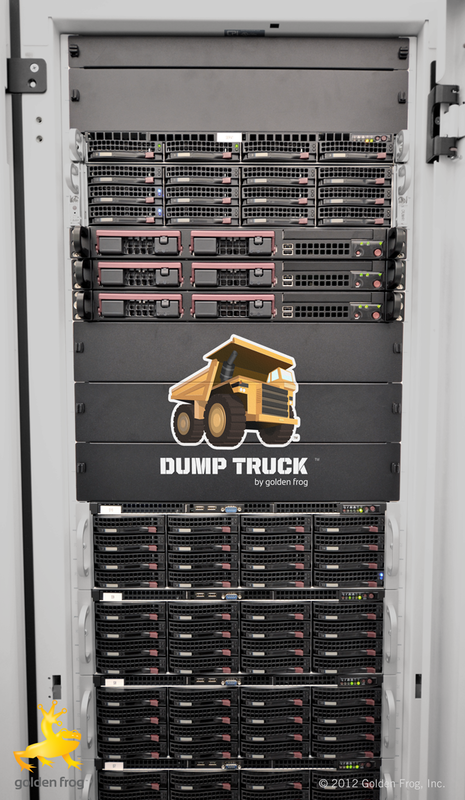 Photo of 500 Terabytes of Dump Truck Online Storage! Unlike many storage providers, Golden Frog owns and operates the hard drives and servers and manages the network, so we can deliver the best security and performance to our customers. Simply put, we don’t rely on third parties to store your data. When you upload to Dump Truck, Golden Frog is the only company who handles your information so your privacy and security is ensured. The photo below is a rack of servers from Dump Truck’s online storage cluster in the brand-new behemoth 130,000 SF Data Foundry data center called Texas 1 in Austin, Texas USA. This rack of storage servers is roughly 500 Terabytes of storage space (or a half of Petabyte). We deployed multiple cabinets just like this one to provide plenty of storage space for Dump Truck online storage. Only Giganews members are currently able to access Dump Truck online storage, but look for a retail release of Dump Truck for Golden Frog customers in the coming months.